It is a similar one that I had already provided for the World Cup 2014. Therefore you will find the information on how to cut and fold it on my YouTube channel HERE. Or you can download the file and follow the instructions on the second page instead. I am little bit sorry that the file is not the smallest. 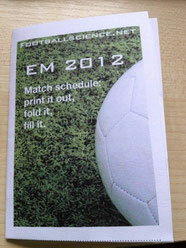 All teams, venues and games on one sheet, ready to be printed, cut and folded. FIFA has released its technical report for the 2014 World Cup. The report is 284 pages in length and provided in multiple languages (French, English, German, Spanish). The Godfather of the 30-15 intermittent fitness test has made some articles available. Buchheit, M., Simpson, B.M., Peltola, E., and Mendez-Villanueva, A. Assessing maximal sprinting speed in highly trained young soccer players. Int J Sports Physiol Perform 7: 76-78, 2011. Buchheit, M., Mendez-Villanueva, A., Delhomel, G., Brughelli, M., and Ahmaidi, S. Improving repeated sprint ability in young elite soccer players: repeated shuttle sprints vs. explosive strength training. J. Strength. Cond. Res. 24: 2715-2722, 2010. Buchheit, M., Mendez-Villanueva, A., Quod, M.J., Poulos, N., and Bourdon, P. Determinants of the variability of heart rate measures during a competitive period in young soccer players. Europ. J. Appl. Physiol. 109: 869-878, 2010. The articles are accessible through Martin Buchheits dropbox HERE. We have given information about the importance of speed (training) in football previously. Additionally we have given information about what to test, however did not provide any “help” or suggestion on how to do that. As a consequence we will provide a data collection and –analysis sheet. Given the fact that acceleration is a very important aspect in football, its monitoring and training seems crucial. Latter is of particular interest for coaches, however, there are multiple possibilities to train for speed, which most likely result in different improvements on sprint performance and therefore affect monitoring. Sprinting can be defined as acceleration (herein it is also possible to discuss “first-step-quickness”), maximum speed, and maintenance of speed. All components have importance in football and therefore should be monitored and trained. For example it was seen that acceleration (0-10 meters) was correlated to maximum strength with 0.9 (= correlation coefficient “r” = 0.9 identicates a nearly perfect correlation, with 1 being perfect – but also unrealistically in a real-world setting). However, the correlation was less strong (r = 0.7 which is strong) on 0-30 meter sprints (5 - see references below) in football players. Similar, acceleration and maximum speed was only correlated with a coefficient of 0.6 (3), which suggest that the two are separate components in elite football players. Additionally, knee extensor torque at 240 degrees per second was the strongest correlation with acceleration (0-10 meter) sprint performance (4). As a consequence it seems that not only maximal strength but other physical qualities are important on a 30 meter sprint. (We also believe that the correlation of 0.7 also derived from the fact that usually players that are fast over 10 meter are quick over 30 meters as well, just as a result that the time advantage from 10 to 30 meter distance will still exist). However flying distance (such as 10-20, or 20-30) seems to be more related to stiffness and some sort of power utilization (power absorption in the eccentric phase of running and utilization in the concentric phase stretch shortening cycle) (1). For example, hopping was the best predictor of the changes in speed between individual phases (such as acceleration and maximum speed). Additionally, maximum velocity was correlated with stiffness (r = 0.7) but not with the acceleration phase (2). Therefore is it important to have a more differentiated analysis on sprint performance as it has consequences on training as suggested by Little et al. (2005). In order to do so, we have provided a first file, which includes sheets to enter AND to analyze sprint performance. Feel free to use. This is a "ready to use" file. Coaches can type in data directly and receive the results immediately on a different sheet. It is also possible to personalize the header and the footer of the sheets in order to print them and to provide feedback to players. We hope the format of the sheets remain when downloading and using them. strength and stiffness as ability factors in 100 m sprint running. J. Sports. Med. Phys. Fitness. 42: 274-281, 2002.
with sprint running performance. Med. Sci. Sports. Exerc. 33: 326-333, 2001.
agility in professional soccer players. J. Strength. Cond. Res. 19: 76-78, 2005.
isokinetic knee strength, single-sprint performance, and repeated-sprint ability in football players. J. Strength. Cond. Res. 18: 867-872, 2004.
correlation of maximal squat strength with sprint performance and vertical jump height in elite soccer players. Br. J. Sports. Med. 38: 285-288, 2004.